I'm giving the Lunasol Dazzling Light another chance after the first few failed application attempts. Something about dark shadows is difficult to get right. For these two looks, I used a couple brushes to apply, for some reason it came out better than using the sponge applicators. 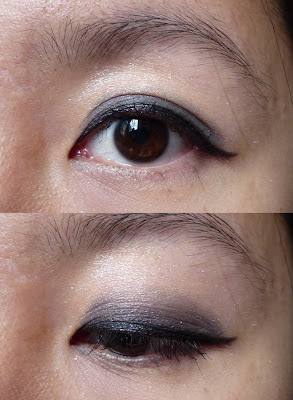 I also blended the white and silver shades together to highlight rather than using them separately. 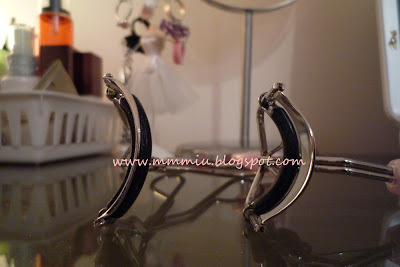 If you've been reading my blogs for a while already, you might be able to help me, which one suits me more? Lining on the bottom or not lining? Or no lined bottom but with winged liner? 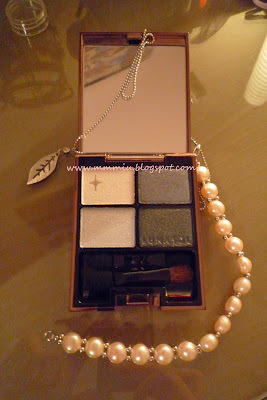 Next, to use the Paul & Joe 062 duo shadows..the grey variation..and get that right! I'm sure some of you who know Miss Tia knows that she's in Toronto at the moment. Annd...I'd like to know who else is in Toronto that would like to get together at the Markham Fair this coming Sunday (Oct 4) It's $10 admisson. Here's the website for details. The job fair wasn't what I expected, nothing useful except the teaching course I looked at while in Korea. I managed to get a part-time job though, through my friend's mom. I just work 4-5 hours on Tuesdays and Thursdays checking application forms and emailing them to insurance companies. I get $12/hr, not bad, it'll pay for my monthly tuition and other stuffs. I don't think I posted this MM swatch before. This along with the yellow was part of their most recent collection. This is the PK441 shade. Out of all the MM polishes I have, this one applies most evenly and least streaky. Cam-whoring.. I don't think I've ever used this term haha. I think the Geo Nudy Greys go very well with purple shadows. 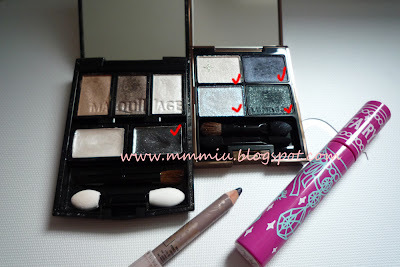 I love using them with the JS 08 Crystal Sky or the Lunasol Purple Gradation palette. Seems to make my eyes pop out that much more hehe. I'm using the Lunasol here. Compared with the JS, the Lunasol looks more "sweet" and the JS looks a bit more dramatic. For those of you in the Toronto/GTA area, don't forget there's the Markham Fair happening between October 1-4!!! It's a $10 entrance fee but you can download the $2 coupon on their website. I'm so excited to go! Wonder what I should wear. Dang Canadian weather, it's so chilly already. I know I haven't really been around blogger a lot. I'm still unemployed and I'm not sure where to go from here. 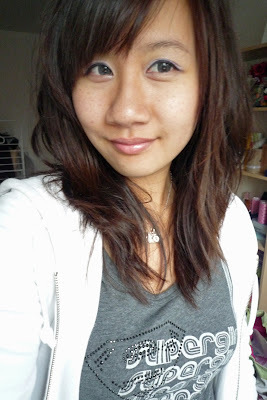 I'm home about 90% of the time and don't really have motivation to blog and use with my makeup when I'm not going out. But good thing for me, there's a 2 day job fair at downtown Toronto that I'm going to attend on Wednesday. I really hope that there are some job offers for Hong Kong, that'll be quite ideal for me. Here's a long overdue swatch of the LE MM nail polish. I had a very difficult time locating it in Hong Kong, probably because it's so popular, so I ended up picking it up in Tokyo. This is the YE242 shade, super bright yellow, great for the summer, too bad I've only started using it right when summer is ending hehe. 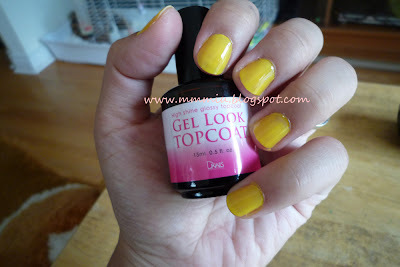 I also have a picture with the D Nails Gel Look Topcoat. You can purchase this on Ichibankao for about $23USD. I got mine for about 1500yen. The D Nails is top coat is supposed to give your polish a gel nail like finish by being super glossy/shiny. I honestly didn't really notice a huge difference with this and the usual PA top coat I use. This top coat is made in the states and I'm sure you can find something similar in North America. I don't think it's really worth the 1500yen because it's not over the top glossy. 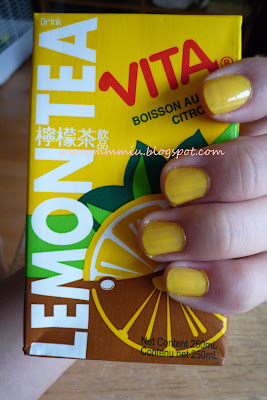 The yellow polish is very similar to the Vita Lemon Teas, yum! 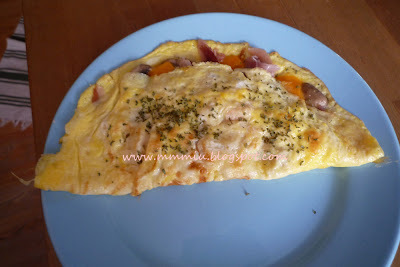 Since I don't have anything to do at the moment, I started to spend more time cooking. 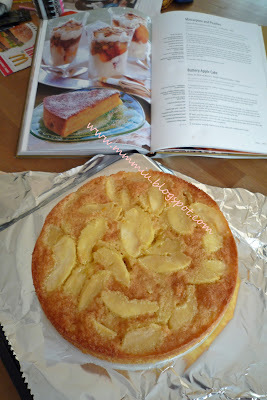 I made this Buttery Apple Cake from the William's Sonoma Savouring Desserts cook book. I've been meaning to do a look with the Lunasol Dazzling Light palette, but I can't seem to get it to work for me. Maybe because I'm not used to using such dark colors, but when I apply it like I normally do for shadows, it just looks weird. I tried following Fuz's look with the palette, but it still looks strange on me. Hope to get it right soon. Haha, my titles are so uncreative. My latest addition to my lippy collection. 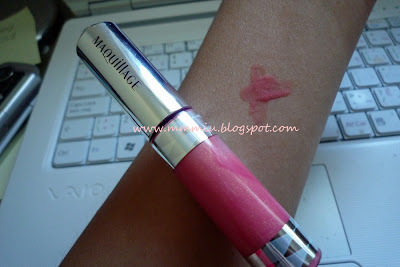 I purchased this Maquillage Perfect Gloss in PK353 while in Tokyo. PK353 is the gloss that's on the model that's holding the coffee cup, I can't remember the name. This came out in July and it's supposed to be part of the Maquillage x Alexander Wang collection. The picture didn't come out quite the way I wanted. It's a bit more coral than pink. The gloss has fine golden shimmers which is uber pretty. I find it a bit sticky, but it's long lasting. I do have a rant though, even when I wipe the gloss off, my lips still feel a bit sticky. The applicator is a flat spatula with fuzzyness on both sides. I really like this applicator since it's easier to apply evenly than then doe foot imo. My attempt at super voluming my hair. I applied the Marc Anthony hair thickener to damp hair then blow dry (the hair dryer I have is so crappy, it's not hot enough bah!). Then I put 1.5inch curlers, 1 on my bangs, 1 on both sides and 2 at the back then sprayed the Lucidol curling water and put heat on it. After doing my makeup, I take out the curlers then curl the ends of my hair inward and outwards with a large barrel iron. Scrunched up my hair with some Liese Designing Jelly in Nuance Wave and used Lucidol Designing Pot in Smash Fixer near my roots. Finish off with Osis hair spray. Whew! So many things just for my hair, I wish it wasn't so flat. The Liese Designing Jelly was advertised in the Vivi magazines with Chikako (spelling?). It's a very runny gel like product. It gives my curls enough hold to last the whole day and just one pump is enough for all my hair. You can get it on Ichibankao.com If you download the Nuance Wave demo vid here, you can see in the video that pieces hair is supposed to stay if you just push it up a bit, and I can confirm that it doesn't do that, at least not with my hair. Next time, I'm going to try adding the Osis dusting powder in hopes for more volume. I love breakfast foods. 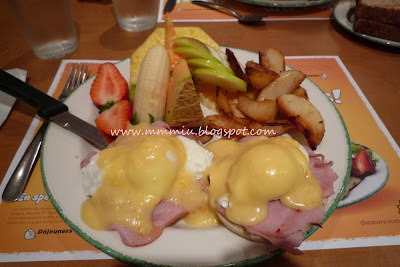 It's been a while since I've been to Cora's for their breakfasts. It closes at 3pm and there's only 2 locations that I know of in Toronto. Omg, it's so freaking good, but expensive. Remember how I said my hair is falling out more than usual in Korea? Well, Mika from Beauty Snap had sent me some samples of hair products that included the Fekkai Protein Rx hair treatment. I tried it out and the next day I noticed less hair fall out. The Protein Rx is a leave in "protein treatment" and you apply it all over your hair just before you sleep, then you wash it out in the morning. It's like a thick cream that absorbs very quickly into the hair so it doesn't get all over the pillows. I don't know if I can describe the smell properly haha, but it smells a bit like sweet coconut and milk. I've used it at least 6 times already and even though I still have a few fall outs, there's way less than when I was in Korea. Besides less hair fall out, I think this is totally helping my hair get stronger because I recently dyed it. 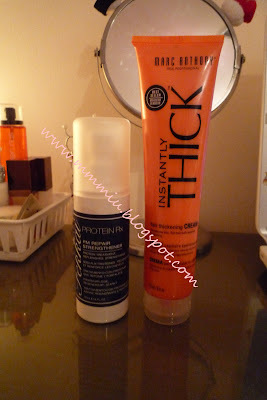 The orange tube is the Marc Anthony hair thickener. It saw 2 tubes in the washroom when I came back. I think this might have come from the shampoo/conditioner sets from Costco. I used to use this product a long time ago, but stopped because it was too sticky and didn't really do anything for my hair. Now I think the formula has changed because it's not as thick and is easier to rub into the hair. It works a bit for me because it helps make my hair thicker, but volume wise, it's not really that noticable. Still, it helps, I need all the volume/thickening I can get. 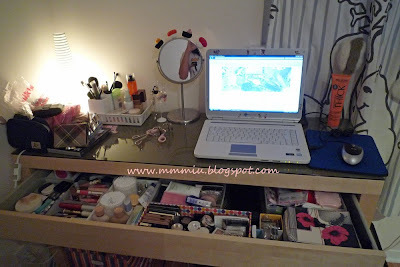 After spending days cleaning my room, it's still not really organized yet, but here's my new vanity table from Ikea. The drawer is enough to hold all my makeup and fit everything on top! Busy busy, going back to clean my room again. I was slacking a lot on room cleaning and blogging. The past 3 days, I spent at Tim's house playing Resident Evil 5, and we beat it yesterday puhaha. I got a new lash curler while in Hong Kong. I saw it on a display at Log-On (City's Super) and it's supposed to be the newest curler by Koji. It was highly recommended by a Japanese magazine, I think Spring?? I got this for about $125HKD. 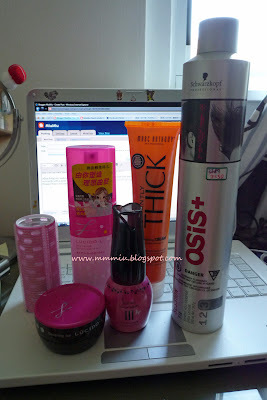 The curler that I used to use is the pink one with the spring inside. (picture from Adambeauty) For those of you who don't know, when you press the handles together, they pop back into place so you don't have to open it yourself. Seems kinda like the lazy way of curling lashes. So what's special about these curlers? Nothing really for the old pink spring one that I used, the new one however, is supposed to have a new design to curl your lashes in a special way. Before I tell you how the new Koji curler does its work, here's a comparison of both the curlers. You can see on the left side, the curler is not as rounded as the spring curler on the right. This alone sells it for me because the old curler didn't fit my eye properly, sometimes I nip my eyes. Ouch! With the old curler, I always had to curl my lashes before I did my eye makeup because it would smudge everything due to the poor fitting. The new Koji curler fits my eye shape perfectly that I can curl my lashes after doing my eye makeup without smudging anything. But, the best part of the curler is the design. Since I don't have a picture of the back of the Koji box I'll have to tell you why it's so good. If you look at most curlers, you'll see that the front of it is relatively straight across, but the new Koji curler isn't straight. 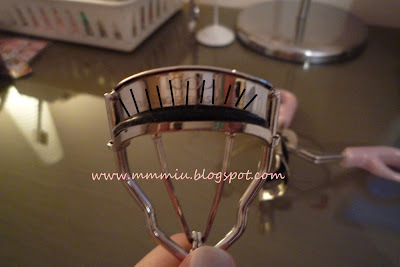 Instead, the ends curve down allowing the curler to hold onto as many lashes as possible and curl them in a fan shape. 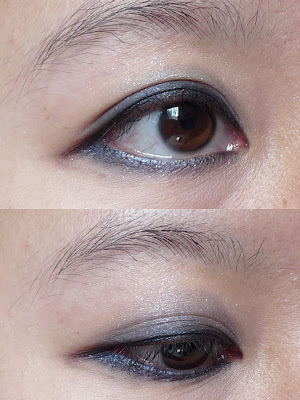 It also doesn't smush all your lashes together and it kind of separates them as you curl. Do you get it? Haha, that's the best I can explain without the packaging. If you look at the picture, you can kinda see what I mean. 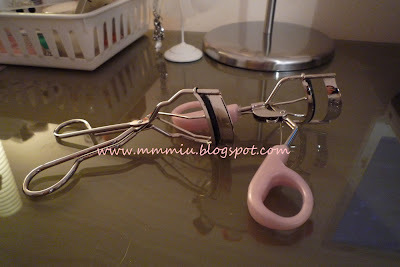 For me, this is a brillant curler because I'm able to curl more lashes than the old one, plus it fits my eye! You can purchase this on Bobodave for $20USD. 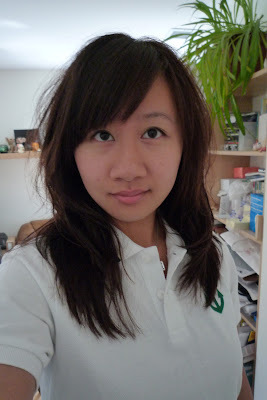 If you speak Cantonese, watch this YT vid to see how the curler works. I'm finally back home in Toronto. I got home last Saturday and this whole week has been non stop cleaning! I don't know how I managed to fit everything into the tiny room in Korea with Tim because I'm having such a hard time organizing everything. I got the new Lunasol palette from the Incheon Airport duty free, it was only $39USD. This is Dazzling Night 03. The lighting isn't very good in my room unless it's daytime, but I'm sure most of you know what the colors look like.